Kevin Smith, is 22-year-old currently finishing up his bachelor's degree at UNLV for Kinesiology. Growing up as a Las Vegas local for 18 years, he has always been passionate about sports and journalism. 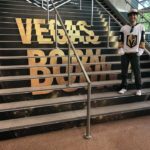 He considers Vegas to be his home and is thrilled to see this city get professional sports teams, and more thrilled to see them succeed. Trade Deadline Rumors: Who Will VGK Bring In For Playoff Push?